On Saturday 24th May 2014, VCSL organised a thought provoking program on benefit of doing yoga exercise and awareness of cancer. It was our good fortune that both Sunilbhai Gosai offered his service to give brief talk on the benefit of doing yoga and Dayantiben Patel talked about her journey through cancer. 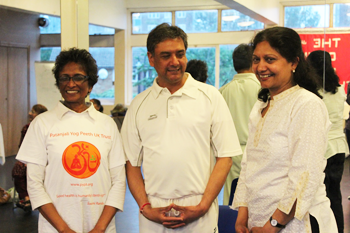 Sunilbhai explained how Yoga has the potential to heal the body on many levels. Our body is our subconscious mind and yoga practices can heal physically, mentally and emotionally issues. The most important aspect of yoga is that it improves muscle and joint flexibility and strengthens them at the same time .Preforming regular yoga exercises has may benefits, however it is difficult to explain these in a short session. Lots of information is available on various websites. Yoga has become popular in the last ten years and many people are taking up yoga sessions as relaxation class, especially those who feel that they live a stressful life. The most important thing is that you have to believe in what you are doing to achieve any result. After brief introduction, Sunilbhai showed us various form of yoga exercises’ which can be done while sitting on chair. The yoga session lasted for about thirty minutes and everyone was happy to continue doing this exercises at their ease. Yoga is no less magical than the power of life itself. It unlocks life’s wonder and unleashes hidden energies. Through this art everyone can experience the Divine and enjoy the ecstasy of freedom from pain and ignorance apart from other gracious rewards like longevity and happiness. It has taken time for us to wind ourselves up in a knot. Naturally it takes time to unravel. If we are still breathing, it is never too soon or late to start yoga. 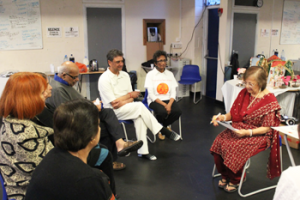 The next session was on open discussion about cancer which Damyantiben Patel gave a brief introduction of McMillan Cancer Society and her lifelong association. She talked about her journey through fighting cancer. 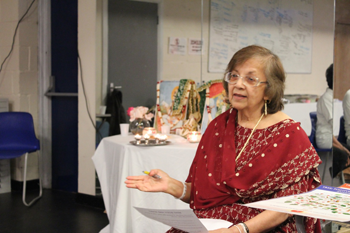 She talked about her battle through pain and recovery but not to forget the battle she had to fight of stigma attached to cancer from Asian society. It was clear that lots of people do not understand what goes through one’s life when one is suffering from any kind of cancer. Speak your feelings if you are suffering; emotions that are hidden can repress the illness. Be positive; negative thoughts can generate negative energy which can worsen the condition. Remember to be gentle, kind and caring with people going through treatment. This means having lots of patience and accepting the person as they are. After discussion we enjoyed healthy refreshments prepared by committee members. 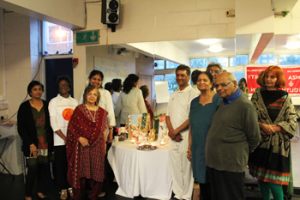 This useful event was very well received by the group and went away with knowledge about how mind, body and soul are connected.